When I heard about Carbon Sports’ new Airblade Hockey Stick, I was extremely curious to see if it really did what it advertised. A teammate of mine was generous enough to let me try the stick out, and as soon as I got hold of it, I immediately felt what people had been talking about. The puck feel was truly something special. Not only did my stickhandling speed increase because of the holes in the blade, but I also felt a unique grip on the puck, created by the little knobs. After enjoying the stickhandling, I remembered that the stick also claimed to increase shot speed due to the lack of air resistance. I’ll admit I do not have the hardest shot on my team, so I was really excited for this. My first impression was that the overall feel of my shot was different. It felt a lot swifter to shoot because of the “airblade” construction. I certainly noticed an increase in my shot speed and so did the goalie I was shooting on. “I wasn’t expecting that power from you… the puck seemed to pop off your stick,” he said. I felt great hearing that because it was coming from a goalie who has been taking my shots for four years now. According to Carbon Sports’ website, the company consists of Tovi Avnery (co-founder), Scott Heitmann (co-founder), and Richard Fucillo (C.O.O). All three of these men got together in the hope of building a product that would be revolutionary in the hockey world. Heitmann and Fucillo both have a background in hockey. Over the years, Heitmann became very frustrated with the technology of new hockey sticks. Companies began sacrificing puck feel, handling, and control in their efforts to improve shot speed and the overall weight of the sticks. Owning his own carbon fiber molding shop, Heitmann decided to pair up with Tori Avnery whose background included mechanical and electrical engineering. My only complaint about the Airblade stick is very minor unless you only buy sticks for their look. I wasn’t thoroughly impressed with the graphics designed on the stick. Compared to other big name companies like Bauer, Easton, and CCM, the graphics on the airblade stick do not have the same professional finish. On the bright side, the hole-filled blade does add a little bit of style to the appearance and makes spectators do a double-take. Aside from the graphics, I think that this is a great stick that not only has changed the game of hockey, but will completely revolutionize the making of hockey sticks. 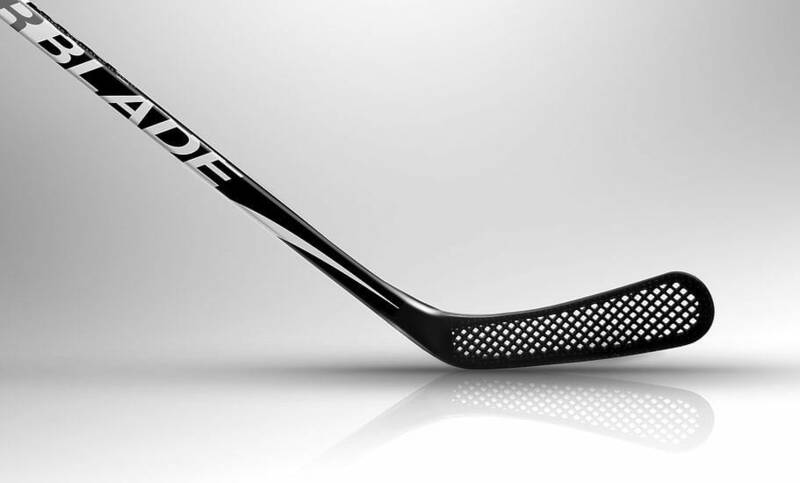 With the offers that the company is giving hockey players, I would think that this stick would really take off in sales. If you are in need of a new stick that is durable and will improve your game, give this stick a try… and if you don’t like it, you get your money back. ​ Not many companies give players this ability, so I advise you to take advantage of it.